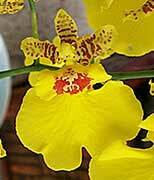 At first glance, this orchid looks like a group of butterflies dancing on air. Instead, numerous petite blooms balance perfectly on a delicate stem. The bright blossoms of the yellow Oncidium are splashed with red and will bring instant sunshine into any well-lit room in your home or office. 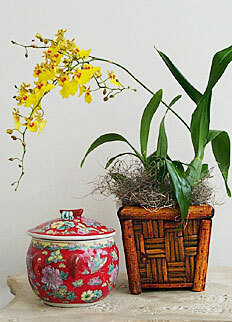 The perfect accessory to this golden yellow oncidium is a wonderful basket - constructed in bamboo, rattan and pine wood - easily purchased below. Whether you start your orchid collection with this beautiful Oncidium or your basket collection with a simple bamboo piece, you're sure to enjoy the results. 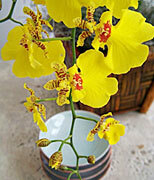 For orchid container, view BASKET for more details.